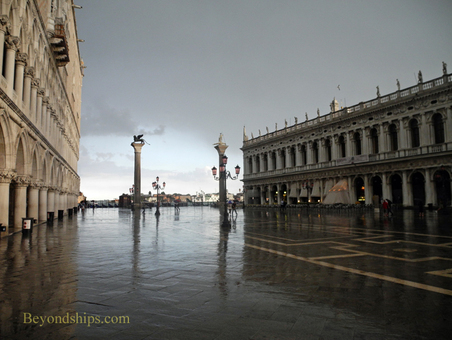 St. Mark’s Square can be called the heart of Venice. 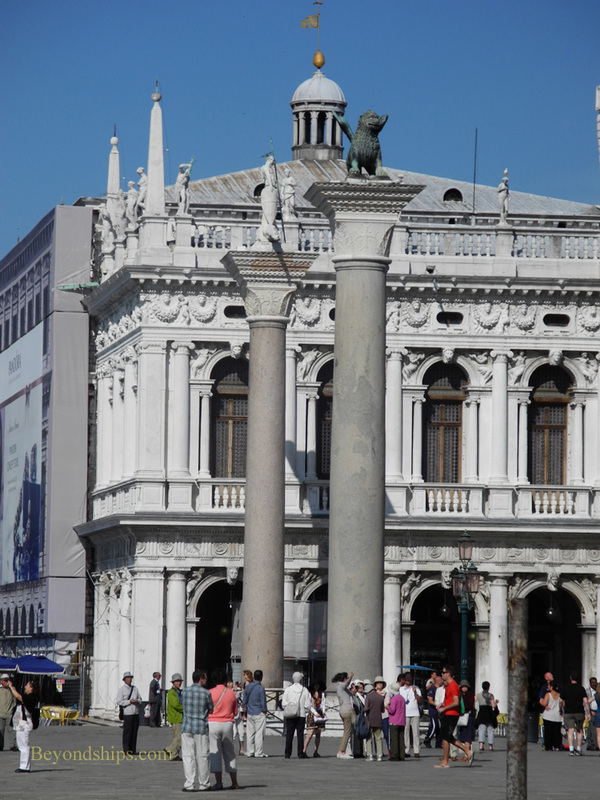 The Venetian Republic’s ancient governmental buildings are here as is the city’s cathedral from which the square takes its name. It was also the place Venetians came to to see and be seen. Napoleon described it as: “The most beautiful drawing room in Europe, for which it is only fitting that the heavens should serve as the ceiling.” To see what he meant, just about every visitor to Venice comes here. 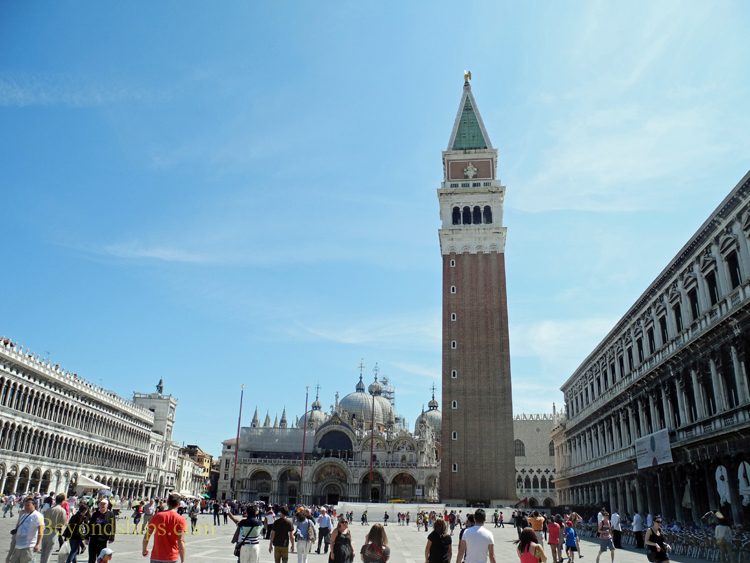 The area most visitors think of as St. Mark’s Square is actually two squares that come together at a right angle. 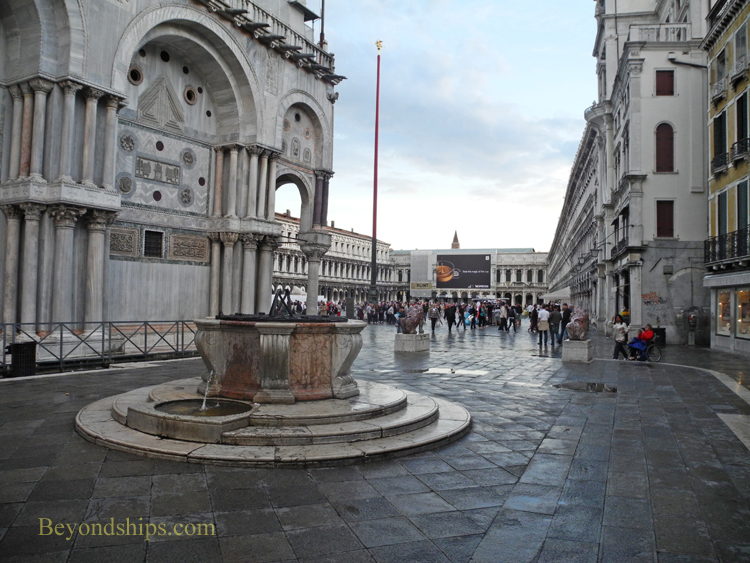 First, there is the Piazza San Marco itself, which stretches out in front of St. Mark’s Basilica. On three sides are arcades built between the 16th and 18th centuries. Today, they are home to famously expensive cafes and restaurants. Near the cathedral on the northern side of the square is the Clock Tower. On top of it are two bronze statues who strike the bell that stands between them to mark the hours. The most visible feature of the square is the Campanile. This rectangular tower rises some 300 feet above the city. It can be seen far out to sea and helped guide ships home in the days before GPS. Originally built between the 10th through the 12th centuries, the Campanile collapsed in 1902. But it was re-built and re-opened in 1912. 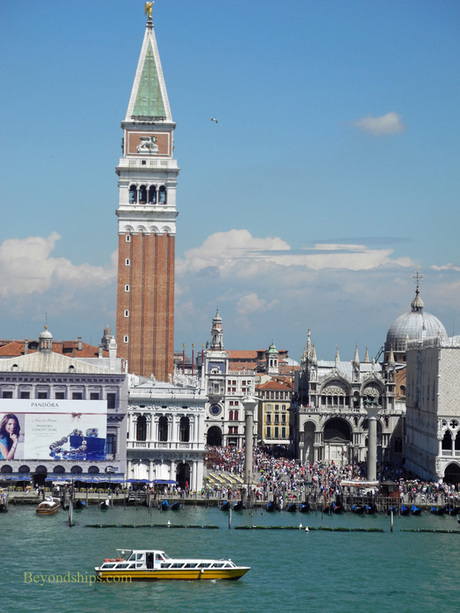 The Campanile stands as the junction of St. Mark’s Square and a second, smaller square, the Piazzeta. Open to the lagoon at one end, the Piazetta connects the heart of Venice to the sea upon which the city was so dependent for its livelihood in the days of the Republic. On one side is the Doge's Palace while on the other is the Libreria Vecchia (Old Library). 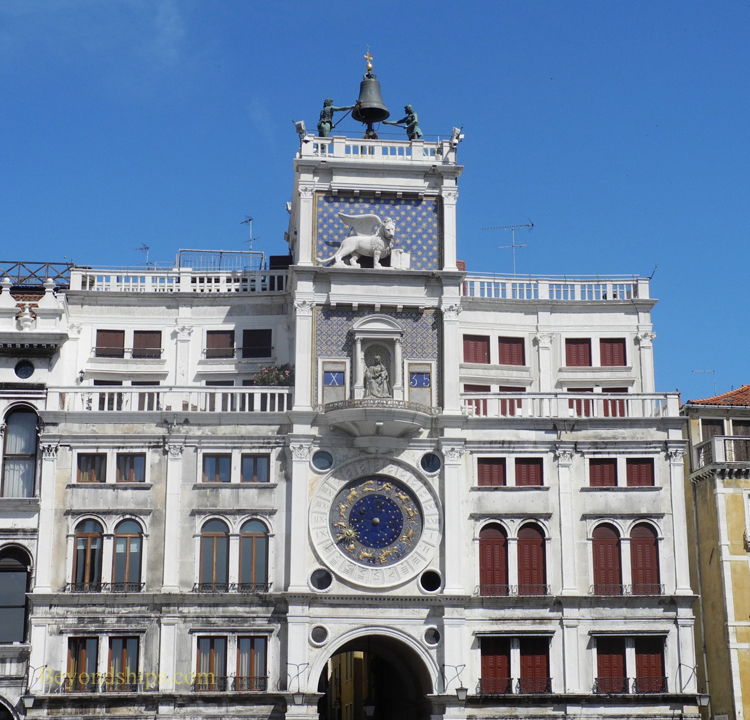 The latter is an ornate building that was considered a turning point in Venetian architecture when it was built in 1563. Inside are works by artists such as Titian, Veronesse and Tintoretto. At the seaward end of the square are two granite columns. 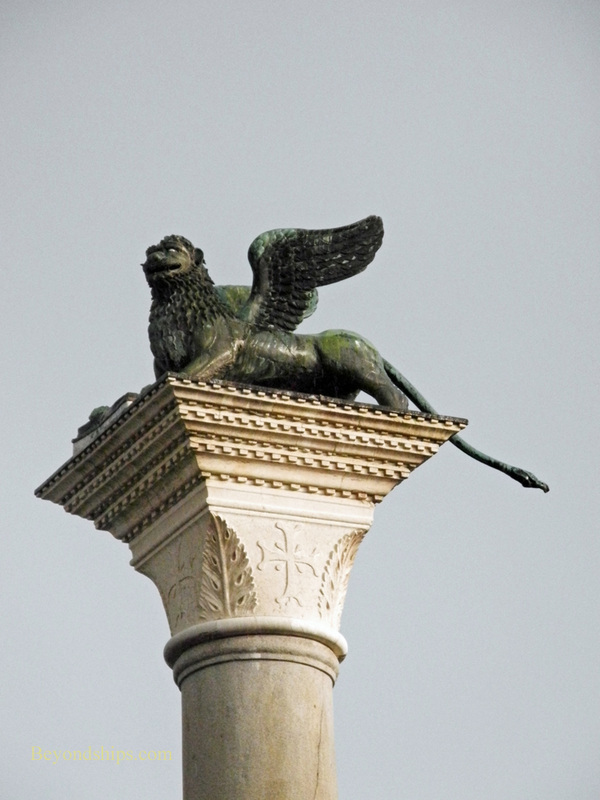 Perched on top of one is the winged lion of St. Mark, the symbol of Venice. On the other is a statue of St. Theodore. 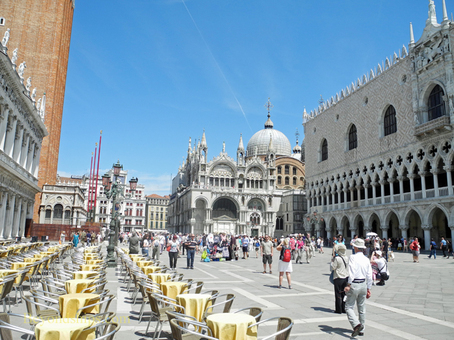 St. Mark’s Square can be crowded on a summer day. However, in the evening or in the rain, it takes on a different character with much fewer people. In addition, while it is quite pretty in the sunshine, it takes on mellower and more romantic looks both in the rain and around sunset. Above: The facade of the western front of the cathedral, which looks out onto the square. Below: The four horses prance over the main doorway. 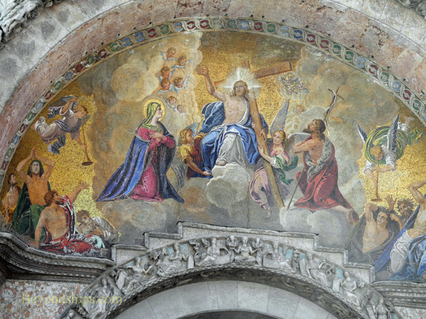 Above: A mosaic depicting The Last Judgment on the western facade. Below: Mosaics appear over each of the large doors on the western facade. In a city where several of the churches could be mistaken for cathedrals, the Basilica di San Marco is the foremost religious structure. However, while it has long been the spiritual center of the city, it has only been the city’s cathedral since 1807. Originally, it was the palace chapel of the doge. 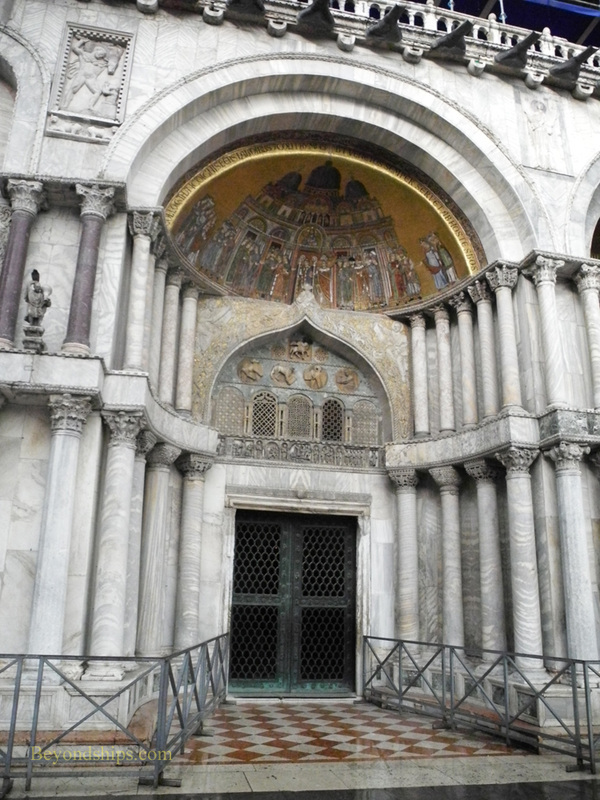 St. Mark’s derives its importance because the remains of St. Mark, the patron saint of Venice3, are interred there. How this cam to pass is not the most noble of stories. 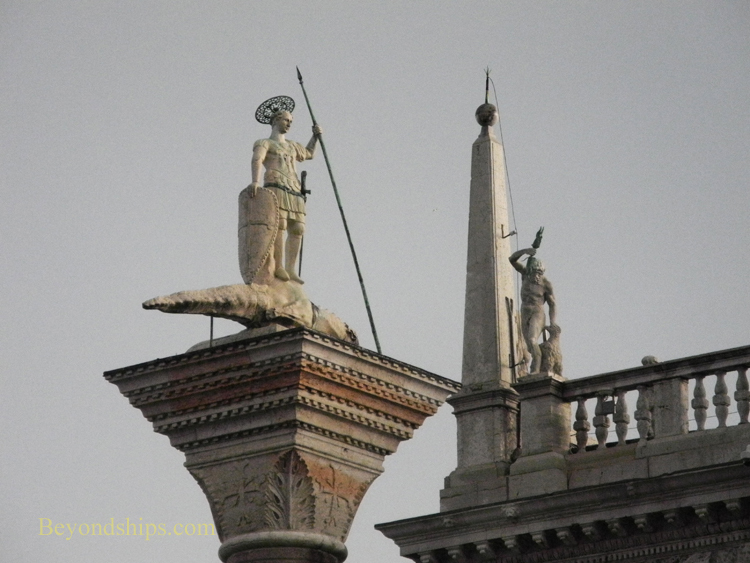 Venice’s original patron saint was St. Theodore. But as the city grew more wealthy and powerful, it was felt that the city needed a more important saint. Therefore, to Venetian adventurers journeyed to Alexandria, Egypt, obtained the remains of St. Mark and smuggled them back to Venice. The present cathedral dates to 1063. Over the centuries, it has grown and has been lavishly decorated. 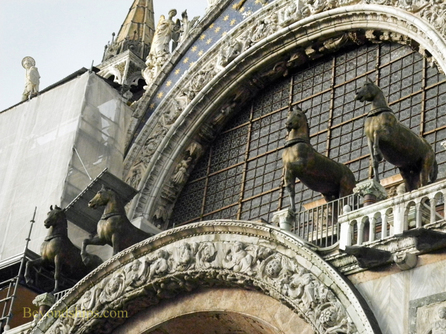 Indeed, a law enacted in 1075 required every ship returning to Venice to bring something precious to decorate “the house of St. Mark.” Since Venice became one of the world’s preeminent maritime trading powers, a flow of magnificent objects for the cathedral followed. Some of the most famous of the cathedral’s decoration are outside the building. For example, over the main entrance are four large bronze horses. The originals (now in a museum) are believed to be Greek from the 3rd century B.C. Napoleon was so impressed by the horses that he took them to Paris after the Venetian Republic surrendered to him. (Before condemning him for such a theft, it should be noted that the Venetians had obtained the horses as booty when they sacked Constantinople in 1204). St Mark’s does not look like a Western European cathedral. Rather, its style was inspired by the Eastern Church. Indeed, the original floor plan was based upon the Church of the Holy Apostles in Constantinople. Over the centuries, the eastern style was largely maintained although there are elements of other styles. Inside, the cathedral is dominated by over 4,000 square yards of mosaics. Most of these are set in gold. 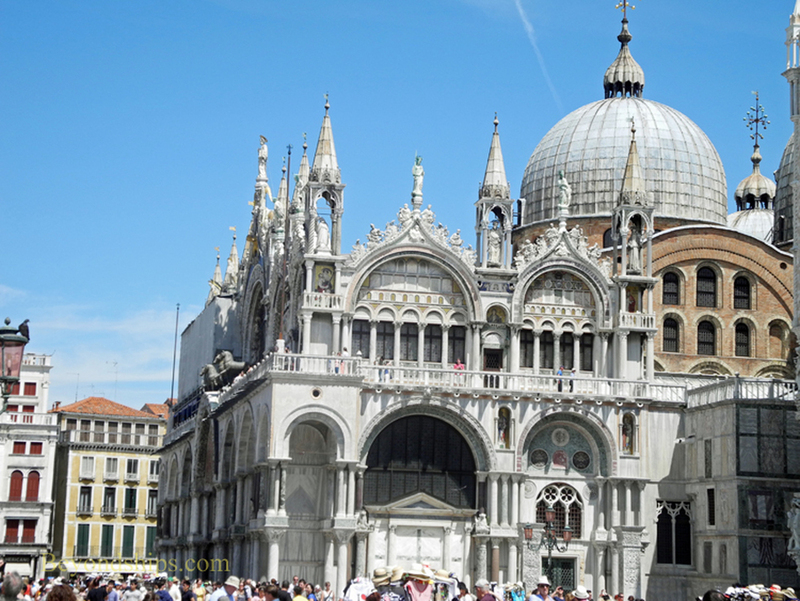 Consequently, St, Mark’s is popularly called the “Basilica d’Oro” (Golden Basilica). 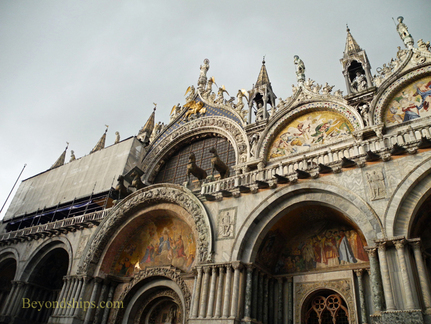 Because St. Mark’s taken as a whole is one of the world’s great works of art, it attracts numerous visitors. During the day, visitors are channeled up one aisle, across the transept and down the next aisle to the door. Because of the crowds, there is no real freedom to wander or to pause for any length of time. A much more satisfying way to see the interior of the cathedral is during the evening when it is open to small tour groups. It is a more relaxed experience and you can take in much more.